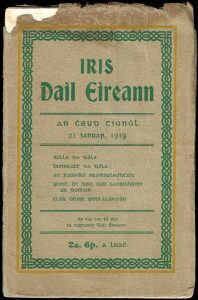 On Wednesday 23 January 2019 Kildare Decade of Commemorations Committee presented a commemorative event, entitled ‘Sworn to be free: a nation reborn’, to mark the centenary of the meeting of the first Dáil Éireann in 1919. Of the 73 Sinn Féin MP’s who constituted themselves as the TD’s of the first Dáil only 28 (some say 27) were present. Two candidates were returned for Co. Kildare: Art O’Connor, who was imprisoned in Dartmoor Jail at the time; and Domhnall Ó Buachalla, who took his seat as the inaugural Dáil went into session. Speakers included the Mayor of Co. Kildare, Cllr. Seán Power, and Mario Corrigan (Kildare Library Services). The central focus of the event featured Ciara Plunkett, news editor of KFM Radio, in conversation with Ceann Comhairle Seán Ó Fearghaíl and members of the Oireachtas for Co. Kildare. It took place in the main ballroom of the Osprey Hotel, Naas, Co. Kildare at 8pm. From Century Ireland: Dáil Éireann meets in Mansion House.